Source for image By Mauricio Anton. The likely ancestor of all extant species of Canis and probably the dhole and African wild dog is featured in this print. The smaller canid featured here is Eucyon, a type of canid that lived in North America during the Late Miocene (10-5 million years ago). Eucyon is both the genus and common name for these canids, which weighed about 20 pounds. Eucyon means “original dog,” and it believed that all the extant Canis and possible Canis species evolved from some sort Eucyon species around 6 million years ago. 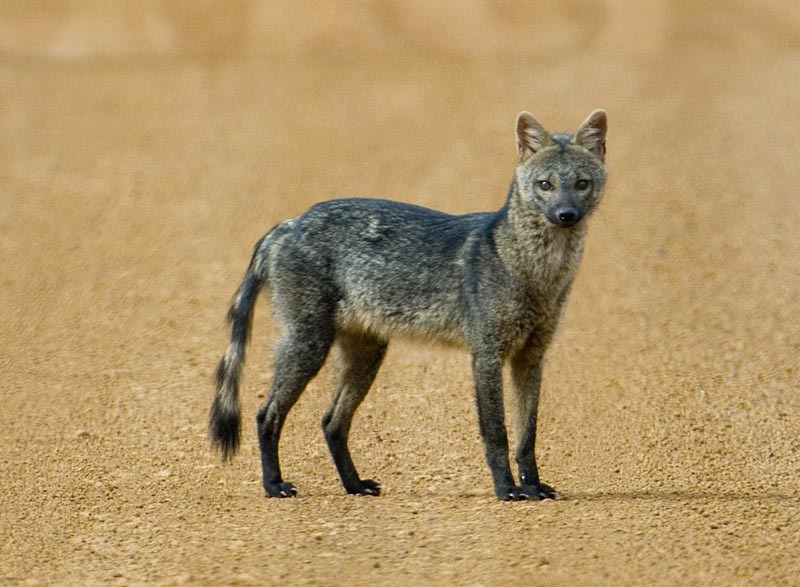 The oldest extant Canis species is the black-backed jackal (C. meslmelas) of Southern and East Africa. Mitochondrial DNA studies suggest that it split off the Canis lineage between 2.5 and 4.5 million years ago. I have seen depictions of Eucyons that show them looking a lot like black-backed jackals. However, black-backed jackals are still quite derived from this ancestor, and from my reading of the literature, this depiction is more accurate. The morphology of this animal is believed to have been very similar to a crab-eating fox, which isn’t actually a fox. For most of the dog family’s history on this planet,North America was the main center for their evolution. Canis came from North America and then spread throughout Eurasia and Africa. The dire wolf eventually colonized South America, and then through the domestic dog, the genus eventually spread virtually every else. Yes. Dogs are much more American than any of us African great apes! A side-striped jackal (Canis adustus), the jackal no one talks about. We’ve always called the smaller wild dogs in the genus Canis jackals. Historically, there were four species of jackal: the golden (Canis aureus), the black-backed (Canis mesomelas), the side-striped (Canis adustus), and the Simien (Canis simensis). At one time, they were all placed in the genus Thous. This, of course, assumed that these animals were all closely related to each other. However, as we’ve looked at DNA analysis, the relationship between jackals shows that the term “jackal” is actually quite meaningless. In 1994, an mtDNA study revealed that the Simien jackal had certain mtDNA sequences that were more similar to wolves than other jackals. It was thought to be a relict population of primitive wolves that came into Africa during the Pleistocene. And from that time forth, the English name of this species was change to “Ethiopian wolf.” I don’t call it anything else. However, as more work was performed on jackals, certain facts became evident. Initial studies of black-backed, side-striped, and golden jackal mtDNA revealed that black-backs in East Africa had huge variances in their mtDNA. Golden jackals had mtDNA that was most similar to coyotes and wolves, while black backs and side-stripes were more similar to each other. And then the phylogeny of the dog family was drawn from a high-quality sequencing of the dog genome revealed that golden jackals were much more closely related to coyotes and the wolf and domestic dog species than the Ethiopian wolf was. We still call them Ethiopian wolves, even though golden jackals are more closely related to actual wolves than those animals are. The other issue revealed through this research was that Canis, as it is traditionally classified, is a paraphyletic genus. Modern taxonomy is generally concerned with classifying animals according clades. Clades are, by definition monophyletic. That is, they contain all the animals that descend from a particular lineage. The dog genome research revealed that two species that are never traditionally classified as being part of Canis, the African wild (Lycaon pictus) and the dhole (Cuon alpinus), actually should be included there. It turns out that black-backed and side-striped jackals are more distantly related to the rest of Canis than these two species are. And if we classify Canis with all the jackals, the Ethiopian wolf, and the wolf and dog species and leave out the dhole and African wild dog, we’ve created a paraphyletic genus that is not useful to modern taxonomy. 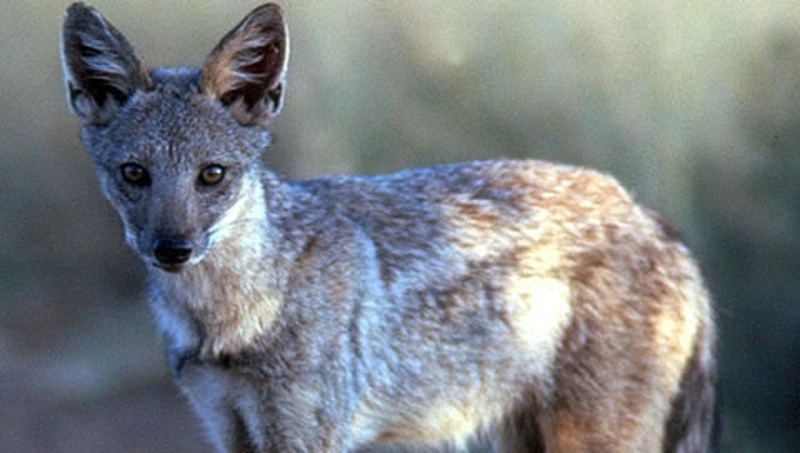 Some have suggested giving the two endemic African jackals their own genus. And this would make Canis monophyletic without including the African wild dog and dhole. However, the genus that would remain would include several species that are all chemically interfertile with each other (at least in theory). Species complexes exist throughout that part of the Canis, and delineating species is very difficult the species in this lineage. All this research has revealed that how we have traditionally thought about the dog family is probably wrong. The golden jackal is actually a primitive offshoot of the wolf lineage, just as the coyote in the New World is. The Ethiopian wolf is an even more primitive offshoot. 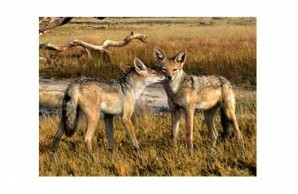 The two endemic African jackals are the two oldest living species in the Canis lineage. They are even more distinct from this lineage than dholes and African wild dogs are. We do not have a good replacement word for jackal. I’ve suggested that we call golden jackals “Old World coyotes” almost as a joke. But I don’t have a good name for either of the two remaining jackal. Whatever we call them, the term jackal, if it’s used to reflect close relationships between species, is utterly meaningless. With the exception of the two found only Africa, it doesn’t refer to any animals that have a close relationship with each other. It’s just a term we use for smaller wild dogs that are in some way related to wolves. This phylogenetic tree comes from a study that used a high quality draft genome sequence of the domestic dog to make important comparisons within domestic dog breeds and also to make some comparisons with their relatives. One of the most interesting discoveries in the this study was that the genus Canis as it is currently classified is paraphyletic. Paraphyly is a major problem in cladistic taxonomy, for the goal is to have genera, orders, and families all to reflect common ancestry. 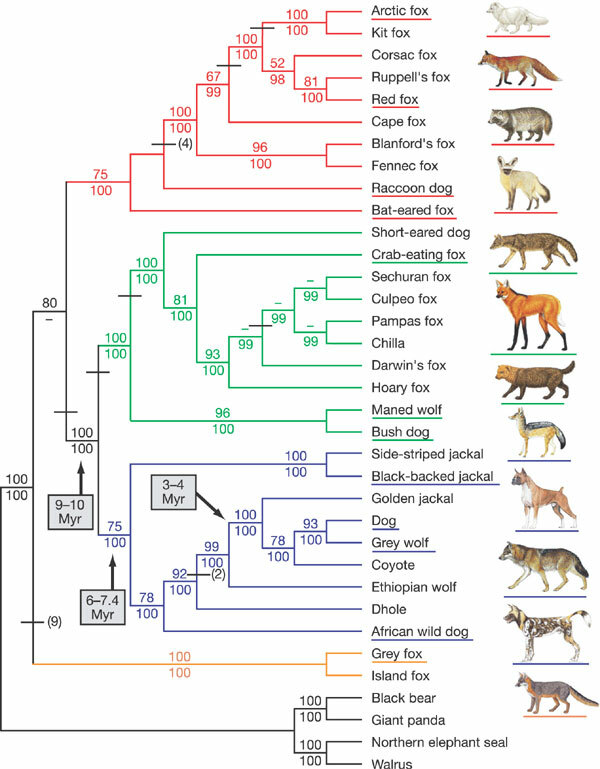 But if one looks at the species currently classified as belonging to the genus Canis on this phylogenetic tree, there is a gap between the two endemic African jackals– the side-striped (Canis adustus) and black-backed (Canis mesomelas)– and the other species in the genus Canis– the Ethiopian wolf (Canis simensis), the golden jackal (Canis aureus), the coyote (Canis latrans), and the Holarctic wolf/domestic dog/dingo/New Guinea singing dog species (Canis lupus). This clade of Canis includes the interfertile Canis, where hybridization is possible between all members. The two endemic African jackals cannot cross with any other members of the genus. Let me repeat that: there are no black-backed jackal or side-striped jackal hybrids with domestic dogs or any other dog species. Some people claim that pariah and village dogs from Africa have ancestry from these jackals, but no genetic evidence has been provided to confirm the existence of these hybrids. If one follows that phylogenetic tree, the gap between the two groups of Canis is filled with two species. These are the so-called “hunting dogs,” which we call the dhole (Cuon alpinus) and the African wild dog (Lycaon pictus). The most common hypothesis about the origin of these dogs is they are both derivatives of an extinct wolf-like dog that was called Xenocyon lycaonoides. There is some debate about whether both of these dog descend from them, but the bulk of the literature suggests that they derive from this species. Xenocyon filled the same ecological niche as wolves eventually did, but it was not part of the wolf lineage. The conventional thinking on Xenocyon is that it evolved into the dhole and African wild dog species, but there is at least one study that suggests that the African wild dog derived from a different lineage. I am a bit skeptical of this study because it was based upon tooth morphology. Tooth morphology is one aspect that has led us to believe that African wild dogs and dholes are related, but one should keep in mind that tooth morphology once led us to believe that dholes and African wild dogs were closely related to the South American bush dog (Speothos venaticus), which we now know is part of the South American canid clade. If these tooth adaptations can evolve from that such disparate lineages, I don’t see why they couldn’t have evolved from unrelated lineages in the past. Whatever the exact ancestors of the dhole and the African wild dog, they create a gap in the phylogenetic tree between the interfertile Canis and the endemic African jackals. That means that we have to make Canis monophyletic. The easiest way to do this is to get rid of the genera Cuon and Lycaon. The African wild dog becomes Canis pictus (the painted dog) and the dhole become Canis alpinus (the mountain dog). I don’t recommend going with Canis lycaon to denote the African wild dog. This name has been bandied about for the proposed but now largely falsified Eastern wolf species, and using this name for the African wild dog would just make things very confusing. If Cuon and Lycaon are no longer unique genera and the species within them are reclassifed as Canis, the entire genus becomes monophyletic. I would recommend this recourse. However, one could keep Cuon and Lycaon if one created a unique genus for the black-backed and side-striped jackals. Several genus names have been proposed for jackals, but I don’t know if we have a good system for coming up with one. The study that suggests that Xenocyon and the African wild dog suggests that we use the Lupulella for these two jackals, which would connect with what have been called primitive jackals that were living in Northwestern Africa during the Pleistocene. These primitive jackals had morphology that was very similar to the modern raccoon dog (Nyctereutes procyonoides). Black-backed jackals in their current form trace to the early Pleistocene in East Africa, so they likely didn’t derive from these primitive ones in Northwest Africa. And it is unlikely that side-striped jackals evolved from them either, for it is a newer species than the black-backed jackal and is usually considered a sister species with the black-backed jackal. Indeed, it is also possible that side-striped jackals derived from black-backed jackals that were adapted to living in dense forests. The skull morphology of the ancient Lupulella suggests that it may not have been a jackal at all, but it may have been a dog derived from the raccoon dog lineage that just happened to have some features in common with modern jackals. Raccoon dogs and bat-eared foxes are currently considered basal foxes. At one time, they were both considered basal to the entire dog family, but now the only odd-ball basal canid species are the gray foxes in the genus Urocyon. It is at least as likely that the extinct Lupulella species were jackal-like derivatives of the raccoon dog lineage, and combining modern black-backed and side-striped jackals with these species is not well-advised. Therefore, the best course of action is to move the African wild dog and the dhole into Canis. However, I do think we need to create subgenera within Canis to denote phylogenetic relationships. These subgenera should create three clades: one for the interfertile Canis, one for the hunting dogs, and one for the two endemic African jackals. This is perhaps the best way to do away with a clumsy paraphyletic genus. And one should understand that the genus Canis is not the only paraphyletic clade in zoology. The truth is we have lots to figure out about the exact evolutionary relationships that exist between different species. There are some species, like the South American red brocket deer (Mazama sp. ), that likely contain several different species from very distinct evolutionary lineages that have been combined within the same species based upon nothing more than superficial reasons. With Canis, fixing this problem is pretty easy. However, it might be difficult to get the scientific names changed to reflect phylogeny properly.